Dan Kneen on the Mar-Train Yamaha Superstock machine. Manx rider Dan Kneen has been ruled out of this year’s Isle of Man TT through injury, with Northern Ireland’s Mar-Train Racing team also forced to withdraw from the event as a result. Kneen sustained a broken arm in a mountain bike accident at the beginning of May and missed the North West 200, where Jeremy McWilliams filled in on the Yamaha machines. Kneen had hoped to make his return at the TT but the Braddan man was declared unfit to race by the event’s Chief Medical Officer, Dr Gruff Evans, on Tuesday. Team owner Tim Martin has been left with no option other than to withdraw from the event and described the situation as a ‘disaster’ for the Lisburn-based squad. “It is difficult to accept at the minute, I am gutted for Dan on a personal level as I think he would have had a great TT and possibly scored his first podium,” he said. “As a team we have been working towards this year’s TT since we did the deal with Yamaha UK eighteen months ago so to have to sit the event out is quite simply a disaster. “For Yamaha UK this should have been the showcase for how far we have come and how competitive the YZF-R1M now is so to not be represented at the most famous race in the world is a major blow. “I fully respect the decision of Dr Evans though: the TT is one of the most gruelling motorcycle events there is with enormous physical demands on the riders over a two week period,” he added. “To go into the event injured would be irresponsible and potentially very dangerous, so it is the correct decision no matter how disappointing. 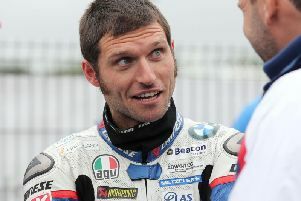 “All we can do now is try to bounce back at our remaining events beginning with the Southern 100 in July,” Martin said. Kneen was also left bitterly disappointed by the outcome and says he has now switched his focus to regaining full fitness for the Southern 100 in July. “I have tried everything possible to get myself fit again for the TT but unfortunately time is just not on our side. I had kept positive right up until today that I would make it but the reality is it is just too soon,” said the 28-year-old. “I can only apologise to the team, YMUK and all my personal sponsors, to miss out on the TT is especially hard to take as a Manxman as I am sure everyone can appreciate. “Everything was going perfectly up until the injury, the bikes were superb and I really had a chance of a result but it just wasn’t meant to be. “My focus now is on completing my recovery and bouncing back at the Southern 100 to try and repay the team for the work they have put in,” he added.